1) If you’re not sure whether you want to permanently remove your Facebook account, you can deactivate it. This way, you can rejoin within 30 days without losing your data. To do that, head to Facebook’s security settings page. 2) Now click Deactivate your account. This link is buried beneath “When you’re logged in” and you are unlikely to see it unless you’re looking for it. 3) Facebook will now try to emotionally blackmail you into reversing your decision. If you ignore the photos of the people who “will miss you”, you can select any reason and click Confirm. 4) If choose to delete your account permanently, go to Facebook’s account deletion page and click Delete My Account. 5) You’ll see a pop-up, where you’ll have to enter your password and characters shown in an image (captcha). Click Okay and then click Okay again in a second pop-up. Facebook gives you a chance to change your mind – if you log in anytime in the next two weeks, Facebook will reactivate your account. 1.Go to Google Account Settings. 2.Select Delete your account or services under Account preferences. 3.Click Delete Products. Note: You can also choose Delete Google Account and Data to remove your entire Google account (including your search history, Google Docs, AdWords and AdSense as well as other Google services). 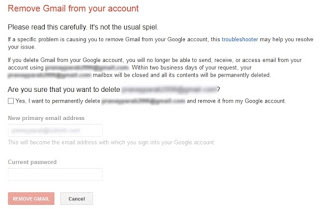 4.Select the Gmail account you want to delete. 5.Type the password to the account over Enter your password. 7.Click the trashcan icon (🗑) next to Gmail. 8.Enter an email address different from the address associated with the Gmail account you are closing underEnter an email address in the How you’ll sign in to Google dialog box. Note: Gmail may already have entered the secondary address you used when creating the Gmail account. The alternative email address you enter here becomes your new Google account username. Also important: Make sure you enter an email address to which you have access. You need the email address to complete deleting your Gmail account. 13. Under Confirm Gmail Deletion Select Yes, I want to delete example@gmail.compermanently from my Google Account. 14. Click Delete Gmail. Important: You cannot undo this step. After you click this, your Gmail account and messages are gone. Did you accidentally sign-up for Google+ from your Gmail account? It is extremely easy to delete your Google+ profile but it can have some unwanted consequences. First, your YouTube account will be removed too. Yes, all your YouTube comments will be removed and if you have a channel, it will be disabled. Secondly, you will not be able to leave reviews on Google Play store. This is because Google has integrated all three services together. 1) Go to the Google+ Downgrade page and sign in with your Google account. 2) Now scroll down all the way to the bottom and click the check-box next to “Required: Yes I understand that…”. 3) Click Remove selected services. 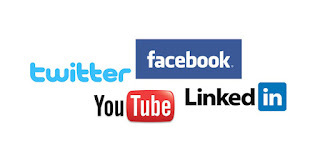 This will delete your Google+ and YouTube accounts. 1) Head to Twitter settings and scroll to the bottom. 2) Now click Deactivate my account, which is a link below the Save changes button. 3) Twitter will give you a warning about what this means. If you’re sure, you need to click on the Deactivate button. This will deactivate your Twitter account. If you change your mind and choose to return to the social network, you will have to log in within 30 days. After 30 days, Twitter will permanently remove your account. 1) Open LinkedIn’s Privacy & Settings page and sign in. 2) Click the Account tab next to the shield icon near the bottom-left of the page. 3) Under the Helpful Links section, select Close your account.